who's ready for the Indians' Home Opener? Dr. 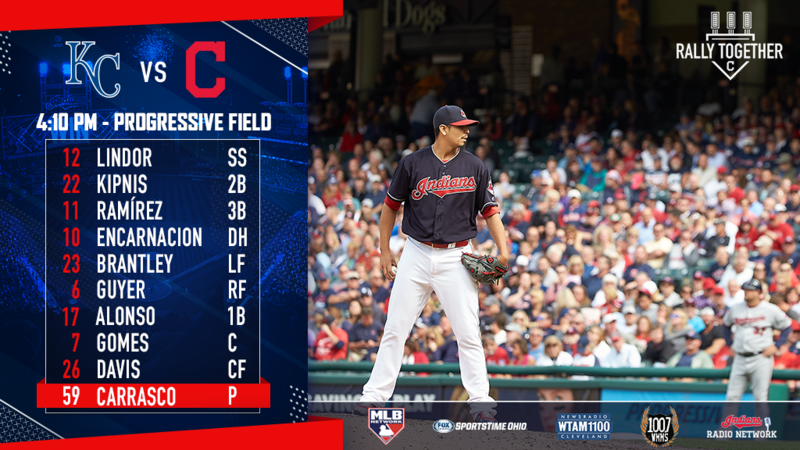 Smooth is!👋 today, on April 6, the Cleveland Indians activated Michael Brantley from the 10-Day DL prior to the game versus the Kansas City Royals! Tyler Naquin was optioned to the Triple A Columbus Clippers in a corresponding roster move. Michael is in the starting lineup, despite the cold, wintry mix of weather conditions expected this afternoon, batting 5th and playing in left field. after staying back in Arizona to play in extended spring training with minor leaguers and the rookie league kids in order to continue building up endurance, Michael is now set to begin his 2018 campaign with the Tribe! or, more specifically, his last campaign with the Tribe.😞 yes, that is correct. this is most likely going to be the final year that Indians fans have to witness the amazingness that is Michael while he's still a member of the Indians. following this brief delay to the start of his regular season, it is now officially the beginning of the end of an era--the Michael Brantley Era in Cleveland. trust and believe, the tears will be flowing hard from me; i just hope i can hold out until October.😭 but i digress. when he sprained his right ankle on May 7, 2017. it happened as he tried to run out a ground ball and stepped on 1st base awkwardly. he ultimately had to leave that game and then missed three more before returning. 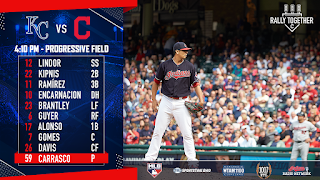 the issue cropped up again in an early June series, but Michael played through the soreness until he went on the Paternity List on June 16. after those three days, the Indians moved him to the 10-Day DL to give him another week to strengthen the ankle. the DL stint resolved the problem for a while, but Michael suffered the biggest blow on August 8 when he re-sprained his ankle running in the outfield to back up a play. he was put on the 10-Day DL for the second time in 2017 on August 9 with what turned out to be a deltoid ligament sprain and ankle synovitis. he missed 50 games prior to his activation at the end of the season, played a little bit in the American League Division Series, and then underwent right ankle surgery on October 18--exactly one week after the Tribe's postseason elimination. when Michael reported to Goodyear this February for spring training, he was able to hit and throw, but was limited in his running program. he progressed from straight-ahead running, to forward and backward running, to lateral movements (cutting and turning), to baserunning. he played in one simulated game, three minor league games, and three Cactus League games before the Tribe broke camp. the Indians and Michael both conceded that he hadn't played enough in the field to feel ready to take on the workload of an every day player yet, so it was decided that he would remain in Arizona and play in some extra games with the minor leaguers as the Indians opened their regular season. now let's get to the daily updates from Michael's DL stint. March 28: Michael played in a minor league game in Goodyear with the Triple A Columbus Clippers. Tribeinsider on twitter reported that the game was at 6:30 pm, which i'm pretty sure meant 9:30 pm ET. the spring training minor league boxscore report provided by pressbox.mlb.com showed that the Clippers faced the Triple A affiliate of the Milwaukee Brewers--the Colorado Springs Sky Sox. Michael bat 2nd in the lineup, but wasn't given a fielding position. i have to assume he played left field and i don't know why that wasn't listed. the Clippers won, 5-3. offensively, it was noted that Michael had five plate appearances and two at bats, but the latter is unquestionably incorrect. (see why i like to do my own documentation?!) he went 2-for-5 with a single, home run, two RBI, one run, and one strikeout. 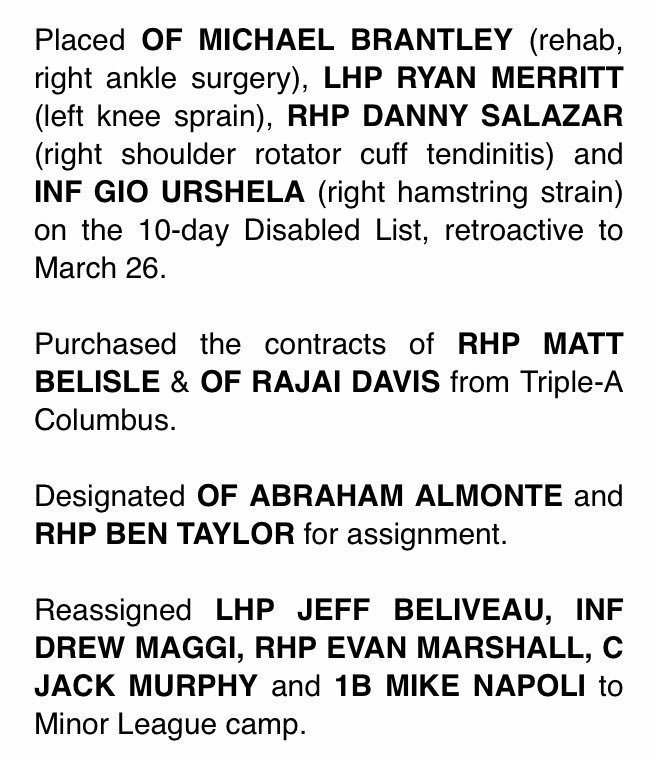 March 29: according to a press release on mlb.com/indians, prior to the Indians' first game of the regular season, Michael was officially placed on the 10-Day DL, retroactive to March 26, as he continues to rehab from right ankle surgery. if he only spends the minimum 10 days on the disabled list, then that would make him eligible for activation on April 5. however, the Tribe has off that day, so he wouldn't be activated until April 6, the day of the club's Home Opener. i wrote a separate detailed blog with much more information about this topic here. Terry Francona revealed, via Jordan Bastian's Opening Day Pregame Minutiae blog on bastian.mlblogs.com, that Michael played nine innings in his rehab game yesterday. "he was only supposed to go seven and he ended up going nine, because he felt good. so, that's really good. we're still working through, when the Triple-A breaks Saturday [March 31], what we're going to do. and when we find out, i'll let you guys know." JB additionally acknowledged how Francona recently said one option might be for a handful of pitchers to stay back in Arizona to give Michael some live hitting practice. but hitting isn't the concern--he seems close to being ready in terms of plate appearances. the primary concern is Cleveland's training and medical staff is trying to ensure that he is ready to handle the time on his feet over the span of several days in a row. as for being the team's DH, Bastian speculated Michael could see time there to get him off his feet here and there when either Yonder Alonso gets a break against a tough lefty or Edwin Encarnacion needs a day off. March 31: Ryan Lewis tweeted Michael is expected to play in a couple minor-league games on Monday [April 2] and Tuesday [April 3] in Arizona. a Triple A pitcher might stay back as well. the club will then determine the next steps in terms of workload, location (due to cold weather), etc. "you what know? from what i understand, they have Monday and Tuesday, they have some games in Arizona planned," Francona disclosed in Bastian's Pregame Minutiae blog on bastian.mlblogs.com. "i don't know. my guess is the rookie league kids probably. and i think they're trying to maybe hold out a Triple-A pitcher or two. i know they have two games planned, because Gio [Urshela] is going to do the same thing." will Michael start a rehab assignment once he finishes with the extended spring games? "let's see where he's at. i think we're still trying to figure out what to do, especially if it's that cold--things like that. it's hard to send somebody somewhere and not play, so we're kind of working through all that." Bastian's article on mlb.com/indians specified the opening schedules for Akron and Columbus, should Michael need to play more games with the minor leaguers. Akron's season starts Thursday, April 5, at Altoona, and Columbus starts Friday, April 6, at Indianapolis. Columbus doesn't play at home until April 12, and Akron's first homestand begins a day later on April 13. not an ideal time for rehab, i'll tell ya. in the bottom of the 4th inning of the Tribe game against the Seattle Mariners, Jim Rosenhaus relayed the Elk & Elk injury report on the WTAM 1100 radio broadcast. he stated how Indians President of Baseball Operations Chris Antonetti is encouraged by Michael's progress and it might not be too much after the extended spring games that Michael is able to come back. April 2: in Bastian's evening pregame article on mlb.com/indians, Francona verified that Michael appeared in a game today in extended spring, but no details from it were communicated. Michael will play another game tomorrow and then discuss the next step with the team's athletic training and medical staff. Tito also hinted that if Michael gets through his game tomorrow with no issues, he could be activated when the Indians come home. "we might bring him to Cleveland when we get there and then kind of put our heads together and see what we want to do." does that mean Michael will be activated for the Home Opener on April 6? "it could be," the manager admitted in a cleveland.com article from Paul Hoynes. "i think he's in a pretty good spot, but i think we want to let him get through playing first." Bastian's article further claimed that Michael resumed playing nine innings in recent minor league games. again, it's more a matter of making sure he can play left field regularly and not necessarily acquiring at bats. "it felt better for me in the fact of watching him ramp up, because he had hit so much," expressed Tito. "it wasn't last spring, where we're trying to get him going with the shoulder and it was hard, because you're checking out his at-bats. like, he can have one here, two here. he was built up so much [this spring] that he could hit really as much as he wanted to. "i've said it so many times, but because of who [Brantley] is and how he plays, there's so much consistency in his game that, you put him out in left field and you know exactly what you're getting. and that's a really good thing." Tom Hamilton spoke about Michael during the top of the 3rd inning of the game against the Los Angeles Angels on WTAM 1100. he mentioned that Francona indicated Michael is really doing well in his rehab and the Indians expect to have him back very, very soon. "you can probably surmise we will see Michael Brantley at some point probably early in the homestand." April 3: Andre Knott, in-game reporter for SportsTime Ohio, gave Jensen Lewis and Al Pawlowski an update on Michael before the game against the Angels. from a video posted on SportsTime Ohio's twitter, he informed, "it's a very good chance, Jensen, that we will see Michael Brantley when we get home on Friday [April 6]. he played in games and, basically Triple A games with Double A, Triple A pitchers, both yesterday and today in Goodyear, Arizona. he will fly back to Cleveland in the next 24 hours and most likely we will meet him back there in Cleveland and if everything points the right way and if he can get through today and everything else, they most likely will activate him. now the only thing that could slow the roll down will be the weather. but i don't think the weather's gonna get any warmer from Friday to Saturday to Sunday. i'm not there, you guys are checking the weather. i know Tito, at first and early in the week, that was a concern. but i think he feels like if he's ready to play, he's ready to play--get him in the lineup so, there could be a roster move come Friday. ...it looks like Michael Brantley will be ready to go, boys." April 4: ahead of the game against the Angels, Francona confirmed in his media session that Michael will be activated Friday, April 6. "he fulfilled his obligation [in Goodyear, Arizona]," the skipper declared in Hoynsie's article on cleveland.com. "he flew to Cleveland last night, and i talked to him yesterday," Tito went on in an article by Bastian on mlb.com/indians. "the plan -- i don't think it's any big secret -- the plan is to activate him. i think just, using good judgment, we'll double-check with him. but, i think everybody's on the same page." instead of sending Michael out on a minor league rehab assignment, where inclement weather could disrupt his schedule, the Indians prefer to have him join them and be around their training and medical staff. be that as it may, there's a possibility he won't play in the Home Opener if the weather conditions don't cooperate. a mix of snow, rain, and cold are currently in the weekend [April 6-8] forecast. aside from that uncertainty, it has been established that Michael will be given extra games off during the early portion of his return. "yes, we will," Francona notified. "definitely. [head athletic trainer James Quinlan] sent out kind of a, not a schedule, but just some ideas. common sense, i think, kind of rules the day there." Hoynsie's article also included that right-handed hitters Brandon Guyer and Rajai Davis are expected to face some right-handed pitchers as Michael continues to build up in April as well. when asked if Michael will need to take batting practice in the snow to prepare for the homestand in Cleveland, Francona laughed, "he might have to. we're about to go through it here at home. we've all seen it. it doesn't look real inviting." later, in a video on the cleveland.com youtube channel, Michael described what he loves most about Home Openers. (this video was taken on photo and media day in spring, back on February 21, fyi.) "the sellout crowd and just hearing how excited all the fans are to be back and playing in front of 'em and, you know, how everybody says, 'have a great season,' and just, you know, being back, you know, to where you're comfortable and, you know, fans are cheering for you." April 5: on the Indians' off day before their Home Opener, Hoynsie and Joe Noga chatted about the return of Michael and how that could help the Tribe's offense in their Cleveland Baseball Talk podcast on cleveland.com. Hoynsie postulated, "i think he's gonna be activated tomorrow, Joe, from what, you know, i've heard and i think that'll help. i don't think he's gonna play every day obviously, but i think that's gonna stabilize, you know, the outfield. you know, it gives Francona a guy that he doesn't have to platoon with, that he's gonna put, he's either gonna hit him 3rd or 5th, and just leave him there. you know, he trusts him in the outfield, he trusts him against lefties and righties, and i think that just, you know, that makes that lineup that much better. the question is how much Brantley's gonna be able to play and, especially in the cold weather here. you know, it's not gonna be very conducive for him so i think, you know, i don't think he's gonna, you're not gonna see him play three or four games in a row right out of the chute here. i think he's, they're gonna use him, you know, judiciously and just kinda work him back into the lineup, but i think it definitely will help and kinda lengthens, lengthens that lineup out." then Noga suggested maybe they will move Jose Ramirez down in the batting order from 3rd to 5th since he only has one hit so far in six games. Zack Meisel recorded a short twitter video of Michael taking batting practice on the field before the game versus the Kansas City Royals. Michael sat in front of reporters after the news broke and, from a video on mlb.com/indians, he explained, "i was playing back-to-back games in Arizona in extended, doing extra work and i was bouncing back and recovering great every day and that was my key. i mean, if i can play 9 innings and i can come back out the next day and play 9 and then feel again good on the third day, i knew i'd be ready to go. you know, i put in a lot of hard work to get to this point and everything's going great. i'm excited where i'm at, excited to be here with this great group of guys in this locker room and, you know, excited to play in front of my home fans today." Francona told Michael on the off day Thursday [April 5] that he would be activated and start in left field today. from Bastian's Pregame Minutiae blog on bastian.mlblogs.com, the manager confessed, "you know what? actually, i kind of knew since Tuesday [April 3] afternoon. it might be a melodramatic. but, he means a lot to us and it is a good feeling. ...like i said, even if he's playing two out of three for the first whatever, having him back is really important. he's such a good teammate, such a good competitor that it will be a lift for everybody, including me." so what will Michael's schedule be like now? "i think the best word is a common-sense schedule. [head athletic trainer James Quinlan] a while back had written something up, kind of given us some pointers. but, we're going to use common sense. i don't think you're going to see him four or five in a row. i think two out of three to start probably for the first week. his availability on days off the bench, we'll see how it goes. "you know what, if it is two out of three, it's worth having him. he means so much to what we're doing and, when he's playing, it's a position you don't mess with. you wind him up, let him go and that means you can maybe mix and match in other positions or do some other things, because that position is solidified. it's really nice to have him back, even if nobody has a crystal ball and you don't know who is going to get hits. but, his being and what he means to everybody will really be helpful." "(i'm going to) listen to my body," pledged Michael in Chris Assenheimer's article on chroniclet.com. "understand what it took to get here -- the lumps and bumps i took along the way. and just understand where i'm at. just really be smart about it. i know Tito and the training staff already have a plan kind of mapped out. we're going to sit down and go over it one day at a time and go from there." in addition, Michael reiterated how being able to hit early during spring training was significant. "it was very important, just because getting in the swing reps, getting in -- your body -- just kind of twisting and moving in that motion, and to be able to work on your swing to kind of perfect my craft. i like to come into spring training every year 100 percent ready to go, playing nine innings and hitting full. but, at the same time, this offseason, i had to work towards that. being able to hit the whole time during spring, i really liked where my swing was at. i got to develop and kind of do my system and my routine consistently throughout spring, which i think will help me out throughout the entire season." **these numbers are not complete. BUT they are also the same as his 2nd spot #s, left field #s, 2nd and left field #s, and outfield #s.
now here are my daily game-by-game numbers and notes for Brantley's 2018 Extended Spring Minor League Rehab. again, this is not complete because i could not find all the usual game details that i like online. i also included the Game # of the Cleveland Indians' games that he missed while rehabbing in Arizona. Game /1, March 29: officially placed on 10-Day DL, retroactive to March 26. Game /2, March 31: still on DL. Game /3, April 1: still on DL. Extended Spring Minor League Rehab Game 2 & Game /4, April 2: no info provided. Extended Spring Rookie League Rehab Game 3 & Game /5, April 3: no info provided. Game /6, April 4: still on DL. My Closing Remarks: Was Michael's Extended Spring Even Necessary? Michael could just as easily have built up his workload while with the Tribe. let's go through the schedule from the first week. Michael could have played in the opener on March 29 and had a built-in off day on March 30. then he could have returned to game action on March 31 and gotten April 1 off, which would have resulted in him playing two of the three total games against the Seattle Mariners. Good Luck & Good Health!